Yay!! It's Friday. Do you all have any big weekend plans? I think mine consists of sleeping a little past 5:00 AM!! Boy the first week of school was hard to get up and going! So, today I am sharing a card that I am actually entering into a variety of challenges that I found through the Daily Dare. 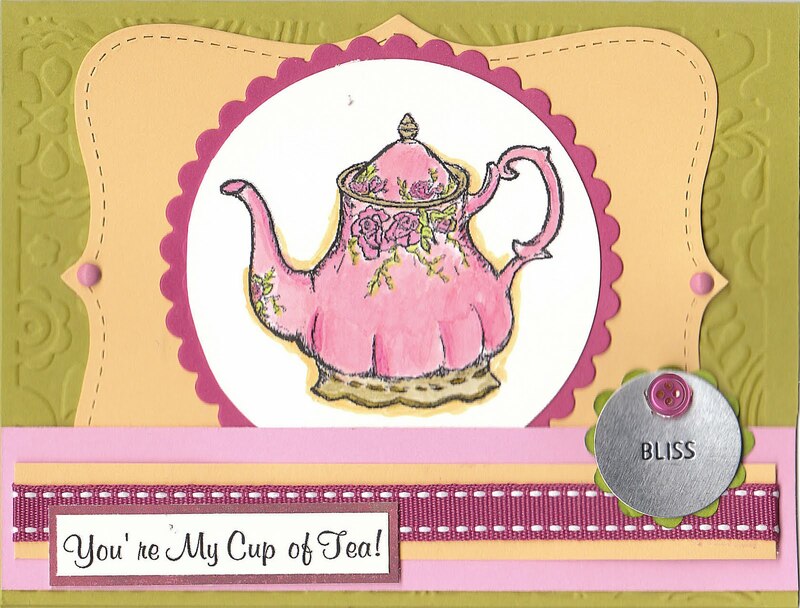 For this card I used a digital image from the Priscilla Styles store. This adorable little teapot also has teacups that you can get as well. I printed it and colored it in with Copics: R20, RV32, RV34, Y91, y95, YG03, Y21. Check out the links for the other challenges as well. Have a great weekend! A very cute card! Hope you have time to rest up this weekend and do some crafting too! Thanks for playing along with us at Operation Write Home! too cute! I love that sentiment. Thanks for joining us at Aud Sentiments and don't forget to enter in our monthly drawing going on right now. I adore tea and teapot and this is no exception. thank you for sharing and leaving me with some wonderful inspiration. I like how your used the top note. Very pretty! Thanks so much for playing the Color Throwdown! Awwh, what a pretty, vintage teapot! Love how you colored it and the sentiment is perfect! Thanks for playing along with the CTD this week!